Playful Pals and Swirly Birds Team Up Together to Create the Greatest Happy Birthday for Someone Special! This week's DOstamperSTARS Challenge inspired the opportunity to highlight my favorite Stampin' Up! Designer Series Paper, By the Shore! 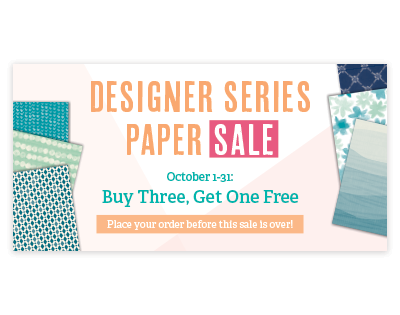 Don't miss the opportunity to get your favorite Designer Series Paper with this great offer only for the month of October! So, let's get started with the fun! The supplies that you will need include Playful Pals Stamp Set #140506, Swirly Bird Stamp Set Bundle #142353, Seasonal Decorative Masks #141848, By the Shore Designer Series Paper #141640, and By the Shore Cardstock Pack #141641. 1. Cut two Dapper Denim 6 1/2 x 5 and one 4 x 4, one Soft Sky 6 1/4 x 4 3/4, one Sahara Sand 6 1/4 x 4 3/4 and one 2 x 6 1/4. By the Shore Designer Series Paper 3 3/4 x 3 3/4 and 2 x 4 3/4. 2. Dry emboss with Big Shot Die Cutting Machine #143263 (use with embossing pad) and Soft Sky Cardstock with Seasonal Decorative Mask. 3. Stamp frog on Always Artichoke Cardstock and Whisper White Cardstock with Memento Tuxedo Black Ink. Cut around stamping with Paper Snips #103579. Stamp and Die Cut with Swirly Bird Stamp Set Bundle #142353. Inks used Calypso Coral, Soft Sky, Crushed Curry, Always Artichoke. Die Cut Crushed Curry and Always Artichoke Cardstock. 4. Pencil around Swirly Scribbles Thinlits and cut wave with Paper Snips. Stamp sentiment with Countless Sayings 2 Polymer Stamp Set #135893(retired 50% savings only while supplies last). 5. Cut flag triangles 3/4 x 3/4 x 1/2 with Paper Snips from your favorite color matching Stampin' Up! Designer Series Paper! Adhere with Stampin' Dimensionals to front along top of cut wave Sahara Sand Cardstock. 6. Inside of card stamp sentiment in Dapper Denim with Flower Patch #134207. 7. Cut along wave pattern on By the Shore Designer Series Paper with Paper Snips. Adhere flags in a two string pattern along top of inside and mat in Dapper Denim.